Following the Paris Agreement adopted last December, eight countries in Eastern Africa have brought together their strategies to fight Climate Change. Sudan is one of them. Sudan is located in North-East Africa and its land was last measured at 2,376 million sq km in 2014, according to the World Bank. “We have the land in Sudan. We can work in forestry, forest plantations. We can work on carbon sequestration, by planting trees. We can work on renewable, solar energy, wind energy, hydroenergy and so on and so forth,” said Dr Hassan Abdelgadir Hilal, Minister of Environment, Forestry and physical development of Sudan, in parallele of the INDCs* Forum in Rabat (Morocco) on october last year. As mentioned in its national action plan, namely Intended Nationally Determined Contributions (INDC), Sudan is “currently implementing some key urgent and immediate adaptation initiatives in six of its eighteen vulnerable states, identified in the National Adaptations Programmes of Actions (NAPA)*. Sudan wants to reach 20% of renewable share in the power mix by 2030. According to the Oil & Gas Journal (OGJ) , published in 2014, Sudan and South Sudan are major oil producers. With the split, they are now ranked as the fourth-largest non-OPEC African oil producer. As oil prices drop, African oil producing countries have to adapt, noted oil strategists, in an Oil week meeting in Cape Town ( South Africa) in 2015. Population in Sudan is estimated 41, 029 476 million in 2016. Energy poverty rates 65% . To achieve energy efficiency, it aims to raise its forest area to 25% by 2030. It needs also to implement its adaptation initiatives based on its National Adaptations Programmes of Actions, notes experts in the Sudan’s national action plan . The main development sectors are water, agriculture and health. A total of 12.88 USD billions has been requested by the country to the international community. It includes 1.2 billions USD$ for adaptation and 11.68 billions for mitigation. “Most of the African countries completed their national action plans, by the 1 october deadline. Most African countries have demonstrated greater ambitions in cutting their emissions than the high-emitting nations,” says the president of the African Development Bank (AfDB), Akinwumi Adesina, in a column published during the COP 21 in the Guardian newspaper. But most African countries pledges for an international financial support. “ We need to implement our adaptation actions. It is our concern. But mitigation is also important. But, we need funds. The money from the GEF is a very small amount,” explains Mr Hilal in Morocco. 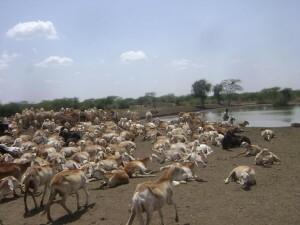 Sudan’s National Adaptations Programmes of Actions, implemented by the Global Environment Facility (GEF) in 2007, is the first adaptation plan which enables the country to receive funds. In 2013, the government of Sudan has signed a USD $7.74 million grant agreement with the world Bank and the GEF to work on issues related to land and water management, biodiversity conservation and ecosystem rehabilitation. In december, US $26-million Water Sector Reforms in West Kordofan were launched jointly with the AfDB and the Government of Sudan. The bank gave a US $ 22 million five years grant. Sudan benefits from the assistance of the bank. Indeed, the African Development Bank delivers to the country technical assistance and capacity building, water, sanitation, health and education. On March 8 , the bank and the United Nations Development Programme (UNDP) discussed about a project to increase energy access through renewable sources. Following the COP 21 meeting, the United Nations Development Programme is piloting a USD 85 million program called Solar 4 Health. It aims to identify sustainable energy solutions for equitable access to health service . Sudan faces deforestation, a looming water crisis, an increased water consumption, with a growing population, and a high variation in rainfall, according to its national action plan. In September 2015, Sudan Forests National Corporation (FNC) and the World Bank launched the Reducing Emissions from Deforestation and Forest Degradation (REDD+)* and readiness projects. It aims to reduce greenhouse gas emission from deforestation and forest degradation . Funded by the World Bank’s Forest Carbon Partnership Facility, this project valued at US$3.8 million. « In Sudan, we have started the phase of readiness. We work with states. We involve every state, we involve also the local people in this process, » affirms Dr Sayeda Khalil, » the National Coordinator of REDD+ Sudan. The Reducing Emissions from Deforestation and Forest Degradation process has three phases : one for Development of national REDD+ Strategies(readiness), second for Result-based demonstration activities and third for result-based actions (fully measured, reported and verified), indicates the UN document.This process intends to enhance integrated management of forests, prevent deforestation and gives multiple benefits, explains UN experts. For Mrs Khalil , REDD+ aims to reduce greenhouse gas emissions. And it allows communities to adapt to Climate Change.« We can adapt by protecting the forest, with agroforestries activities , for example, and people can understand what is climate change, » she says. Sudan’s forests provide a wide range of ecosystem products and services. 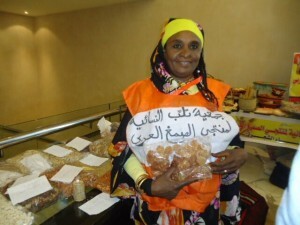 In North Kordofan, there are women and men associations who run a business on gum arabic, which is the most important cash crop in the country. Gum arabic is also a basic component of a famous soft drink. Extracted from a tree, accasia senegal in Sudan, it is cultivated in the poor savanna region of Kordofan and Darfur states. In the phase of readiness, Mrs Khalil and her team have established in North Kordofan a radio program on Climate Change dedicated to communities. « It helps them to understand what is carbon market and how they can have access to it, » she says. Carbon market is a plateform from the « trading of carbon emission allowances » to encourage or help countries and companies to limit their carbon dioxide (CO2) . In the phase two and three of REDD+, people will be paid for their results. But REDD+ process has been criticized in Africa and outside the continent for many years. It has seen as a threat for the community land owners , according to certains NGOs . But for Yao Osafo, Ghana negotiator and REDD+ expert, it is a new era . In December, the Coalition for Rainforest Nations (CfRN), which Mr Safo is a board member, welcomed the Paris agreement . Article 5 of the agreement recognizes the results-based payments for avoided deforestation. In 22 April, there will be a formal signing ceremony of the Paris Agreement at the United Nations in New York. The agreement will enter into force when at least 55 countries representing at least 55% of global emissions have ratified it. Climate Change is already affecting the world and Africa is one of the most vulnerable continent to changing climate, observers say. Sudan climate ranges from arid in the north to tropical wet-and-dry in the far southwest. Early warning systems are crucial for effective governance of climate risks. And understanding public perceptions of climate change risks is essential, according to scientists. “We’ve been providing sattelite, rainfall monitoring accross africa over 30 years, and supporting the national meteorology services to be able to use certain informations and access to these informations,” says Dr Rosalind Cornforth, Director of the Walker Institute at the University of Reading, in the United Kingdom. Mrs Cornforth runs a programme known as Africa Climate Exchange (AfClix) for 5 years. Her goals: sharing information and experience on meteorology. Sudan climate ranges from arid in the north to tropical wet-and-dry in the far southwest. “We actually learn more about some of the research challenges on meteorology, how does the rain runs throught the monsoon, and migrates back, so, for us, it was and it is mutual beneficial,” she adds. Sudan is one of the first countries where we did our work with Tamsat,” she informs. “With Tamsat, scientists from the university of reading take local rainfall informations and calibrate a satellite with these informations to create a country specific algorithm which works,” she says. She is involved in the climate research for development program, which is jointly chaired by African Climate Policy Center, the World Meteorlogy Organisation, and Clim Dev*. “ We are working together to really make climate research count, really make translated into development need,” she emphasizes in Zimbabwe, in parallele of the 5th Conference on Climate Change and Development in Africa. 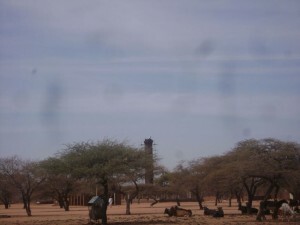 In Sudan and in the Sahel, the University of Reading develops a rainwatch programme. This programme delivers rainfall information through the rainy seasons. But it is not always easy to work. “When our projects are pending, I still make sure that I will send an e-mail context to my colleagues at the national met services in Sudan. I work with many people there, ” she explains. In Eastern and Western Africa, Dr Cornforth is working with researchers, policy makers, communities, NGOs…She is determined and has hope for the continent. “Africa is rising. Africa would be the leader of the world,” she says recently in a Ted Talk about Climate Change in Africa. *Clim-Dev : an initiative of the African Union Commission (AUC), the United Nations Economic Commission for Africa (ECA) and the African Development Bank (AfDB). 4th Climate Change and Development Conference in Morocco Earth Hour: Fighting Climate Change COP 22- Climate Change: to promote youth Empowerment Tanzania : Climate Change can be a primary boost to development.